A cylindrical membrane is stretched by means of isotropic prestress. Find the final minimal shape of the membrane - catenoid. Determine the maximum radial deflection of the membrane. 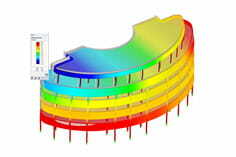 The add-on module RF-FORM-FINDING is used for this purpose. 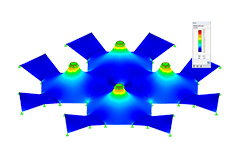 Elastic deformations are neglected both in RF-FORM-FINDING and in analytical solution, also self-weight is neglected in this example.